The Yellowstone National Park was created by the United States Congress and President Ulysses S. Grant on 1 of March of 1872. It is a national park located in the United States, mainly in the state of Wyoming, although it extends through Montana and Idaho. Yellowstone, the first national park in the United States, is also widely considered the oldest national park in the world. It is located above the caldera of the largest volcano in America, very alive but without an eruption since 640 000 years ago. Because of that, it has numerous geothermal phenomena, especially the Old Faithful geyser, one of its most popular attractions. It is also famous for its diversity in fauna, due to the fact that for the last 150 years hunting of any kind is prohibited. The Yellowstone Plateau volcanic field resulted from three volcanic eruptions that spanned for two million years. The first cycle occurred over two million years ago and it created the Island Park Caldera. The second cycle happened approximately one million years later and it formed the Henry’s Ford caldera situated west of the first caldera. The third cycle, that occurred 640,000 years ago, shifted to the Yellowstone Plateau and formed the caldera which is present today. 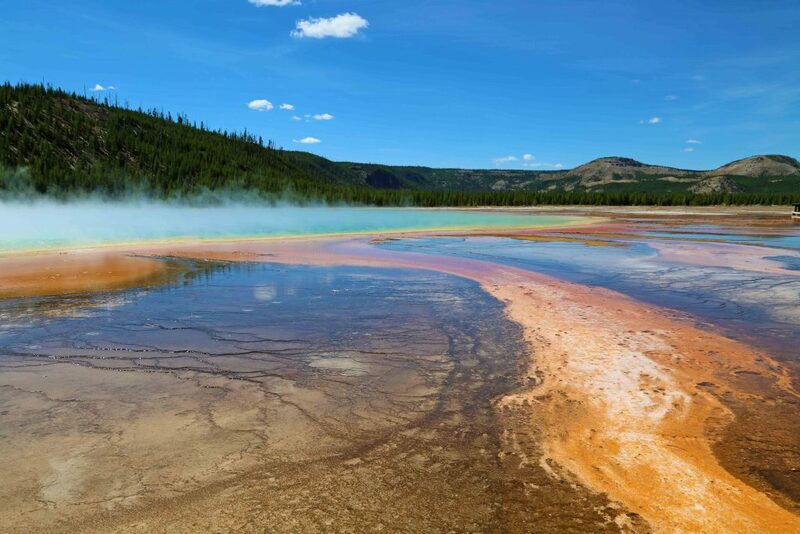 The Yellowstone National Park covers an area of 2,219,748 acres that includes lakes, canyons, rivers and mountain ranges, Yellowstone Lake being the largest mountain lake in North America. The park gets more than three million visitors a year. On peak days, in July and August, as many as 25,000 people wait for the famous geyser, Old Faithful, to erupt. To beat the rush, go before summer, in May. If that’s not possible, avoid weekends and drive around early morning or late afternoon, when there are fewer tour buses. In Yellowstone, traces of human presence have been found, dating back at least 11,000 years. In the 1950s, construction work on the Gardiner Post Office uncovered a projectile from the Clovis culture. In 1806, John Colter, who was a member of the Lewis and Clark expedition, left his fellow travelers to join with a group of trappers led by Manuel Lisa. Under his orders, Colter was sent to explore the upper reaches of the Yellowstone River. He was probably the first European to have visited this region and come into contact with the Amerindian tribes. In 1869, the Folsom expedition ascended the Yellowstone River to Yellowstone Lake. 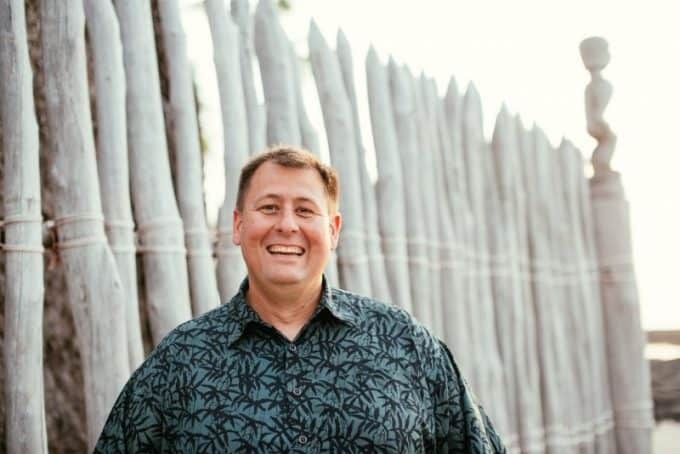 It was the first to provide a detailed description of the Yellowstone region. In 1870, Montana residents also organized an expedition (the Washburn-Langford-Doane Expedition ), led by surveyor Henry Washburn and involving Nathaniel P. Langford and an army detachment, commanded by Lieutenant Gustavus Doane. For a month, they studied the region, collected numerous specimens and christened several places. Cornelius Hedges, a writer, and lawyer from Montana participated in the Washburn expedition. Between 1870 and 1871, the newspaper Helena Herald published several articles that detailed his observations. He was one of the first, with the governor of Montana, Thomas Francis Meagher, to propose making the Yellowstone a protected national park. In a letter of 1871, addressed to Ferdinand Hayden by Jay Cooke, the latter claimed that his friend, Senator William D. Kelley had suggested creating a law that would make Yellowstone a public park. Hayden led a second and more important expedition, financed this time by the Government. He wrote a full report on Yellowstone, illustrated with photographs by William Henry Jackson, 33 and illustrations by Thomas Morgan, which made the US Congress protect this region. On March 1, 1872, US President Ulysses Grant signed the decree creating the “Yellowstone National Park” in order to create a place “free of commercial exploitation, dedicated to the satisfaction of the people.” The Hayden Valley takes its name from this geologist. 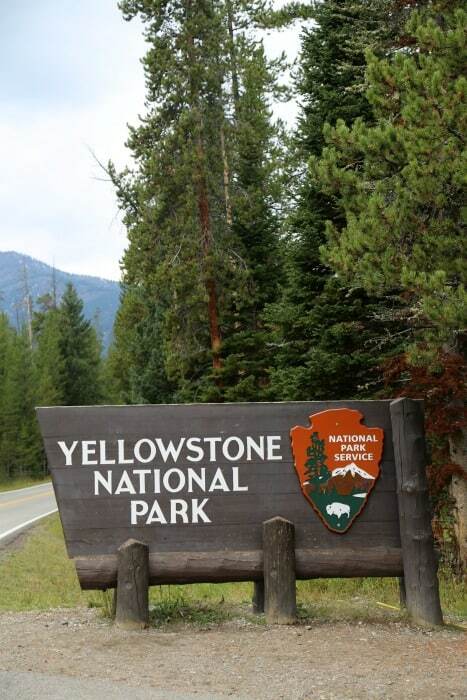 In order to mitigate the insufficiency of means to protect the national park, between 1886 and 1918 its administration was entrusted to the Army but On October 31, 1918, the Army ceded control of Yellowstone to the National Park Service. At the beginning of the 20th century, a 146 miles road with an “8” shape was built connecting the most interesting points of the park. Between 1933 and 1941, the Civil Conservation Corps built the tourist information centers, the campsites and most of the current roads. In 1959, a powerful earthquake struck west of Yellowstone on Hebgen Lake and damaged the roads and facilities of the national park. On October 26, 1976, Yellowstone Park was declared an international biosphere reserve alter on September 8, 1978, it was integrated into the UNESCO world heritage. But in 1995, this Committee placed it on the list of endangered world heritage areas. The poor quality of the water, the tourist crowds and the use of snowmobiles were other reasons for concern. Following the efforts of the federal government, the situation has improved and in July 2003 the park was removed from the list of endangered areas. During the dry summer of 1988, some fires caused by lightning devastated 36% of the surface of the park, 783,880 acres, and the most affected part was North Fork. Today, the National Park Service intentionally causes fires, circumscribed to certain areas already studied in advance, to prevent a catastrophe like the one of 1988. Yellowstone is home to numerous species of mammals, among which the gray wolf (reintroduced species), the lynx and the grizzly (threatened species). 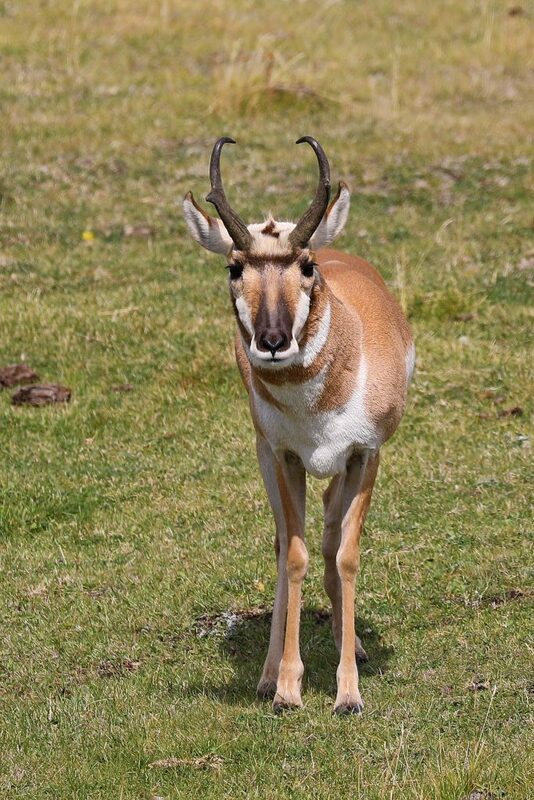 The other big mammals of the park are the bison, the black bear, the puma, the wapiti, the elk, the white-tailed deer, the pronghorn, the white goat, and the Canadian mouflon. The park has around 1700 endemic species of trees, plants, and lichens, to which we must add 170 introduced species. Eight different species of conifers can be found, including the Lodgepole pine. The most visited areas of the park are : Norris Geyser Basin, Cistern Spring, the standing trunk of a petrified redwood tree, about 50 million years old, Mammoth Hot Springs, Narrows of the Yellowstone River, Grand Canyon of the Yellowstone, Fountain Paint Pots, Clepsydra Geyser, Old Faithful Geyser, Morning Glory Pool, Midway Geyser Basin, and Grand Prismatic Spring. Yellowstone, the world’s first national park, formed in 1872, is about seven hour’s drive north from Salt Lake City, three hours from Jackson, and very close to the town of West Yellowstone. At nearly 12,000 square miles, it has an amazing variety of sights to offer, whatever your interests. Where else in the world can you find geysers, hot springs, fumaroles and other signs of hot geothermal activity, with snow-capped mountain peaks close by, huge meadows dotted with bison, elk and mule deer, rivers steaming as hot springs empty into them, waterfalls and a canyon, all in one park? The main road in the park is the 142-mile Grand Loop Drive, with upper and lower loops, forming a rough figure-of-eight in the center of the park. On the undulating Yellowstone Plateau, you cross the Continental Divide twice, heralded not by towering cliffs, but by two markers: Continental Divide 8391 feet and 8262 feet. Accommodations in the park, often difficult to get in summer, ranging from rustic camping to the luxurious lodges. Many people stay just outside the park and drive in every day.